Antec Inc, the global leader in high-performance computer components and accessories for the gaming, PC upgrade and Do-It-Yourself markets, has announced the warranty extension of Antec VP series of PSUs - VP450P, VP550P, VP650P & VP650PM from 2 years to 4 years through its 'Warranty Extension Campaign'. With this newly extended warranty, Antec users can purchase VP series of PSUs with even greater confidence. Antec VP series is crafted to fulfill three things - Quality, Performance and Incredible value. The entry level and mainstream solutions give everything a user needs in the PSU: Stable power, advanced Hybrid Cable Management and heavy-duty protection circuitry for peace of mind, no matter how demanding the system is. Kevan Li, Business Head - India at Antec Inc, said "Antec Power supplies have always been an epitome of the best in quality, functionality and reliability. End users today are much more aware about their PC component requirements and wish to choose the best quality products for their computing system. 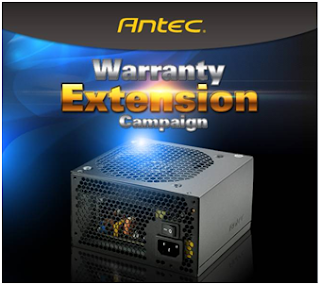 The Antec Extended Warranty Campaign for the VP Series of Power Supplies is a step in the direction to enhance the confidence and trust of our customers and to deliver long lasting product value. " "Antec Power supplies have always been an epitome of the best in quality, functionality and reliability. End users today are much more aware about their PC component requirements and wish to choose the best quality products for their computing system. The Antec Extended Warranty Campaign for the VP Series of Power Supplies is a step in the direction to enhance the confidence and trust of our customers and to deliver long lasting product value. "